June 22, 2016 By John P.
If you ever dreamed of owning a Segway, but the $5,000+ price tag was too much for you, get ready to pull out your wallet because there’s a new Segway hitting the market next week for $999! You can ONLY order it on Amazon, and you better get your pre-order in NOW. Because they’re probably going to go as fast as Apple’s iPhone releases – but without years of manufacturing capacity buildout. 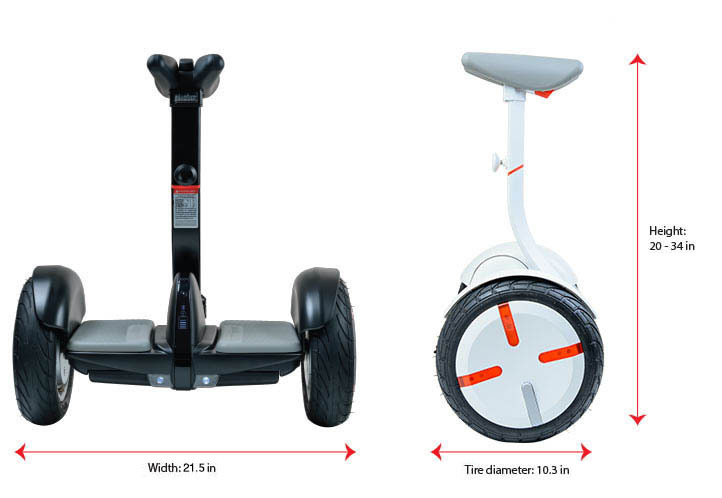 Before we get started, you should know that Xiaomi, a tech company in China, acquired Segway last year and has just released this unit using knowledge it obtained from Segway, the inventor of self balancing technology. Xiaomi is marking the Ninebot as a “Hands-Free, Self-Balancing Personal Transporter”, and making sure to say that it’s NOT a hoverboard. There is quiet a bit of differentiation, starting with the huge power difference. The Ninebot has a 1600 watt dual motor engine, compared to the 300 watts found in a hoverboard. They also point out that the miniPRO is UL certified, so it shouldn’t be catching fire. Essentially, the hoverboard is a toy for occasional use for children you don’t like. The Ninebot is what you get when you’re serious! Although the company builds both… but I digress. And to reward you further for your $999 purchase, the Ninebot also offers you a digital leash to control your new pet! You can pair a bluetooth device to your new ride and remote control it around the house. Or the yard. Or wherever your bluetooth can keep a connection I suppose. You can also see your current speed, if you want to be riding and watching your phone… and do things like firmware updates via bluetooth. One other nice feature is that you can connect to the miniPRO with your phone and lock it when you don’t want anyone to be able to use it. So there is at least some form of security. If someone attempts to move or pick up the miniPRO, it will shake and beep violently. Most importantly, you will receive a phone alert that someone has attempted to move or pick up the unit. Though if someone takes it anyway, I don’t know what would prevent them from resetting it somehow at a later time. So take a lock with you! 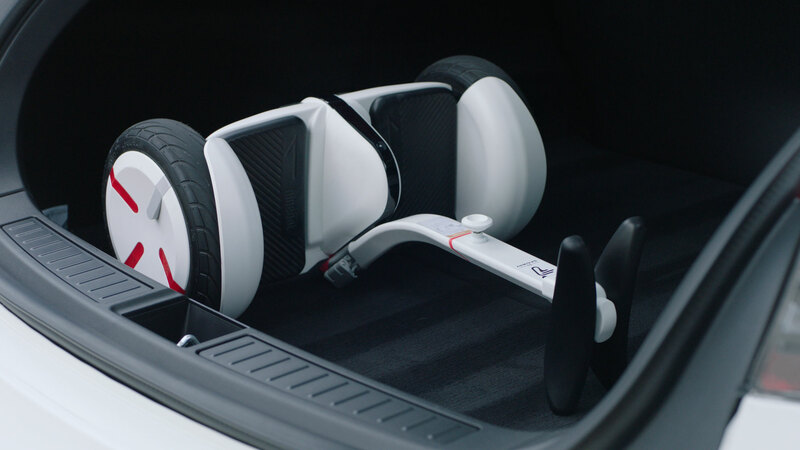 It’s not as small and light as the flaming hoverboards, but you’ll see from the spec below that the unit only weighs 28 pounds, and it’s small enough to fit in a hatchback for sure, and probably most trunks. Though it might not leave a lot of other room. But this would make it a nice last mile commuter vehicle. The knee bar is actually removable, which should help it take up a lot less space in the trunk than in that photo. But no idea how much effort is involved in removal and reassembly. One other nicety you won’t find on competitive products are headlights. And apparently you can control and customize them with the app as well. 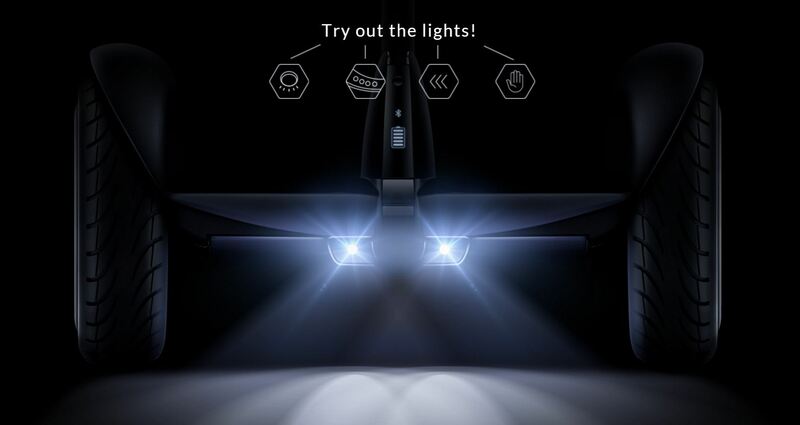 The app appears to also allow you to choose the lighting, although the marketing material claims that the Segway “automatic headlights and LED tail lights will light your way and keep you visible”. They say the lights are adjustable “up to 5 meters”. So I’m assuming the LEDs aren’t that bright, but they should help you keep an eye on the path directly ahead of you if you’re riding in the dark. Speaking of that, the vehicle also appears to have what I can only describe as turn indicators, which presumably would light up after dark to let anyone behind you know that you’re about to make an evasive maneuver. Connect to the free mobile app via Bluetooth for full features: remote control operation, anti-theft alarm, speed control, customizable lights, vehicle diagnostics, and firmware updates. Interestingly, they didn’t mention it in the sales pitch, but a full charge requires about 4 hours. Presumably you’ll be able to purchase additional chargers so you could leave one at home, and one at the office – for instance. You should also be able to use Segways in places other vehicles wouldn’t be allowed. For example, they should be able to be taken on airplanes, and be used on golf courses. This is a very nice article, John. The hoverboard market has changed a lot over the last couple of months. According to my knowledge, The Ninebot Mini looks very interesting. One of my friends used HoverBlaze and it’s awesome! But I suggest you do proper research before buying Ninebot. Because there are many companies can use some cheap parts like tires, batteries, charger and low power motor etc. Anyway Thanks for the useful article. Have you tried to check out the firmware to remove or increase the speed limiter? I’m thinking of downloading and decompiling it to determine this… but wanted to ask around to see if it’s been done yet. I want one but I wouldn’t want to be seen on one. I use it every day for shopping and so on..
Just received mine today and let me say, it’s like riding a bike. It’s a little tricky at first but then becomes second nature once you get used to it. I’m 60 years old (the max suggested age) and it’s a blast. After 15 minutes of practice, I felt comfortable enough to go nearly anywhere. Very maneuverable and pretty quick, even in learning mode. Even an old dog can learn new tricks. At my age (in my eight decade) my balance is not all that great. Without a vertical handle of some kind and with the rapid acceleration, I fear I would fall down on this version. The original has something to hang onto for steadiness and this one could too. Indeed, why not? I guess the answer is that it is not intended for old folks but a younger set who have good balance. I’d love to have the original version but it is way too expensive for my old folk budget. Such is life! There is an optional extention handle that you can buy, that might help you out. Eighth decade, meaning you’re in your seventies, right?